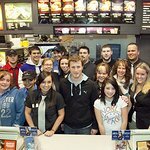 In 2005 Kasey Kahne created the Kasey Kahne Foundation as a way to give back to chronically ill children and their families as well as disadvantaged youth. Every year the KKF raises funds for these deserving causes through several exciting events, such as sprint car races and drifting challenges. In 2006 Kasey was appointed by President Bush to serve as a member of the President’s Council on Service & Civic Participation and through that organization, he strives to bring awareness to the importance of volunteering and giving back to the community. Google trends for "Kasey Kahne Foundation"
We don't have any videos related to Kasey Kahne Foundation.